alaTest has collected and analyzed 208 reviews of Panasonic HX-WA10. The average rating for this product is 3.9/5, compared to an average rating of 4.0/5 for other Camcorders for all reviews. Comments about the price and image quality are generally positive. The portability and size also get good comments, whereas many are negative about the viewfinder and battery. Reviews are divided on the zoom. We analyzed user and expert ratings, product age and more factors. 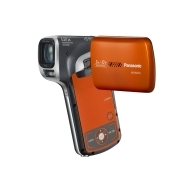 Compared to other Camcorders the Panasonic HX-WA10 is awarded an overall alaScore™ of 85/100 = Very good quality. alaTest has collected and analyzed 45 user reviews of Panasonic HX-WA10 from Amazon.co.uk. The average user rating for this product is 3.7/5, compared to an average user rating of 4.0/5 for other Camcorders on Amazon.co.uk. Reviews about the design and size are generally positive. The portability and image quality are also appreciated. Many are critical about the reliability and viewfinder. There are some mixed reviews about the battery. alaTest has collected and analyzed 6 user reviews of Panasonic HX-WA10 from Amazon.com. The average user rating for this product is 3.5/5, compared to an average user rating of 3.9/5 for other Camcorders on Amazon.com. Reviewers really like the design. Many are critical about the viewfinder. There are some mixed reviews about the usability. Panasonic's HX-WA10 provides a welcome return to the upright camcorder format, and it's waterproof, too! Will waterproofing and Full HD recording combine to make the ultimate consumer camcorder? The WA10 is one of the best waterproof camcorders we've tested, aside from its ergonomics. The WA10 is one of the best waterproof camcorders we've tested, aside from its ergonomics. The HX-DC1 camcorder offers a similarly configured package for AU$299, without the waterproofing. Small, Good enough zoom, Picture quality not bad. Works well out of water. Easy to use. Excellent playback quality.